The Authentic Coach Signature Dog Collar is a flat buckle collar made from smooth leather. These are available in a variety of colors and patterns that change every season. 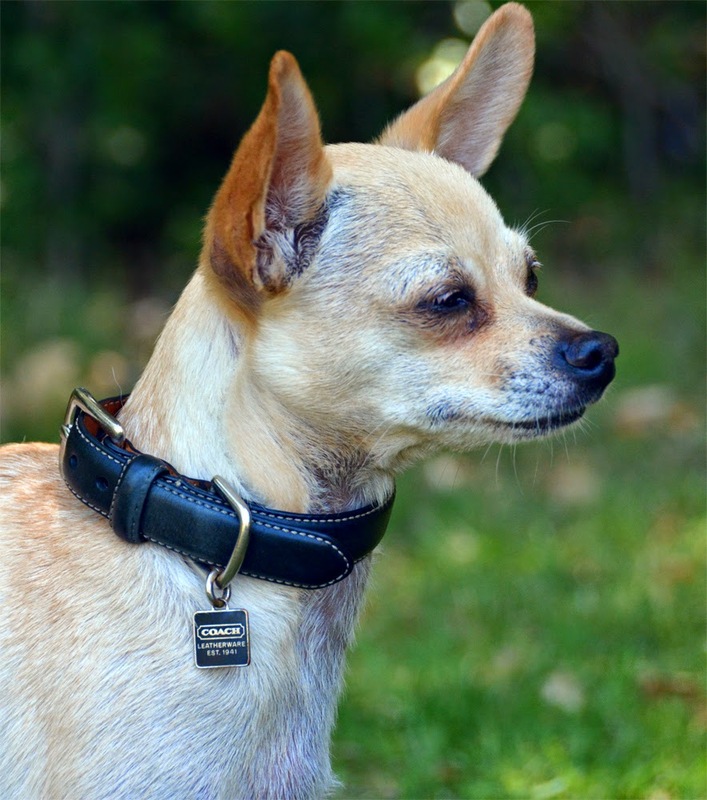 Authentic Coach collars are available in six sizes to fit dogs with necks 6-26" around, though some collars are not available in Extra Extra Small or Extra Large and are limited to 8.5-21" necks. 1. Big enough to wrap around Brisbane's neck twice. Still, that smelly and extremely worn collar was still neatly contained in its original Coach box. I'm not really sure exactly what the attraction is, but I will readily admit that the box to Ru's collar is safely stowed with the rest of his wardrobe. No, I don't know why I'm saving it either. The box from Ru's collar has the original price tag which informs me that it came from an outlet store and cost $50 new. This seems a little steep, given the product itself. Yes, it is a nice plain leather collar, and yes, nice collars can cost much more. However, this is a plain collar for a tiny dog, and that is what makes $50 seem a bit much. Most very nice plain leather collars for tiny dogs cost quite a bit less, it's the ones with crystals and pearls and other decorations that drive up the price. Collars in this price range are usually bigger or fancier. Having seen quite a few old, smelly, and worn Coach collars, I am not inclined to believe that this one is expected to have a longer lifespan, or to look nicer as it ages. I'm pretty sure our WoofWear collars will wear the distressed look better. Pros: Pretty, stylish, doesn't look like it came from a major chain store. Has a nice little tag charm so everybody knows it's by a high-end designer. Definitely a quality product, and made to last. Cons: High price tag is primarily for the big designer name and not because this is somehow a better collar. Yes it has custom brass hardware, but I've also never seen a plain old stainless steel D-ring fail, the brass is prettier and not more functional. I believe these collars are also more prone to developing dog stank, and I don't know that they can be adequately cleaned. Bottom Line: The Authentic Signature Coach collar was nice enough to be worth $20 at the thrift store, but I won't be spending $50-100 on a new one unless I very suddenly become extremely wealthy. I would also love to know who spends this much on a dog collar and then doesn't wash it or the dog.